Martin Heidegger is one of the most influential philosophers of the 20th century. So it should come as no surprise that Heidegger, a life-long man of the Right, is also an important thinker for the New Right in Europe and North America. Heidegger belonged to the broad German Conservative Revolutionary intellectual current. He fell in and out with the National Socialist movement. His encounter with National Socialism and his post-War thinking on modernity, technology, and the possibility of a new dispensation are of enduring relevance to the New Right project of defining a post-totalitarian alternative to both the Old Right and the existing Jewish/Leftist hegemony. 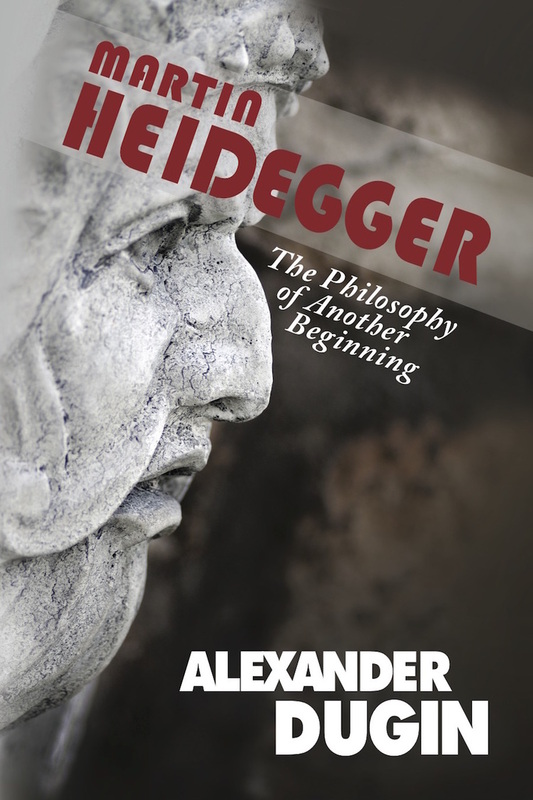 Thus a book-length discussion of Heidegger by Alexander Dugin, who is loosely affiliated with the European New Right, would seem a welcome contribution. There would be two reasons to read Dugin’s book on Heidegger: first, for what it reveals about Heidegger; second, for what it reveals about Dugin. Unfortunately, after nearly 400 pages, I felt that I had learned very little about either thinker. It isn’t easy to write a book about Heidegger, who is notoriously obscure. Unfortunately, Dugin’s method of exposition leans heavily on paraphrase and repetition, and if you have trouble reading Heidegger himself, Dugin’s restatement will hardly be more intelligible. If you are just looking for an exposition of Heidegger in English, there are many better choices. I highly recommend Richard Polt’s Heidegger: An Introduction  (Ithaca: Cornell University Press, 1999), which is lucid, comprehensive, and concise (180 pages). I also hoped that this volume would throw light on why Dugin proposes Heidegger’s concept of Dasein as the “subject” of what he calls the “fourth political theory.” Unfortunately, it adds nothing to what Dugin has said on the matter in The Fourth Political Theory. Heidegger’s favorite word is “Being” (Sein), which he uses constantly but defines only infrequently, incompletely, and in passing. This makes it tempting for readers to plug in notions of Being inherited from the history of philosophy: God, objective reality, ultimate reality, what all beings have in common, etc. All these interpretations founder, however, on the fact that Heidegger insists that Being somehow requires man, or human being (Dasein). Heidegger does not, however, mean that nothing existed before mankind evolved, or that the universe was completed by the evolution of man. For Heidegger, Being does not mean beings (objectively existing things). Nor does Being mean “ultimate reality” (the One, Brahman, God, etc.). Nor does it mean something all beings have in common, like a common element or particle, or the widest, emptiest category. For Heidegger, Being = meaning. To be is to be meaningful. Meaningful to whom? Meaningful to man. And insofar as man is a being who has meaning, Heidegger refers to man as Dasein (or Da-Sein, the place of Being). Meaningful things do not, however, exist in isolation. They are parts of a larger context of meaning, which Heidegger calls a “world.” Again, the tendency is to think of a world as an assemblage of objectively existing beings, which does not require man. Surely it makes sense to speak of the “world of the dinosaurs,” even though mankind did not exist at the time. Heidegger does not deny that dinosaurs existed before us, or that they existed in a web of relationships (an ecosystem). But, again, Heidegger is using “world” in a specific way to mean “world of meaning,” which requires man (Dasein) as the one to whom things are meaningful. But Heidegger’s ultimate topic is not Being (meaning) but the meaning of Being  (the meaning of meaning). This is the question of what makes meaning possible. Since Being always involves man, the question of the meaning of Being involves man as well. Man and Being have a relationship of mutual belonging. Heidegger’s term for this relationship is Ereignis, which ordinarily means “event” but for him also means (1) taking hold (Er-eignis, usually translated as appropriation or “enowning”) and (2) beholding (Er-äugnis, be-eyeing). An English word that captures both taking hold and beholding is “enthrallment.” To enthrall literally means to enslave, but also it means to captivate or enchant by a spectacle. Being and man are mutually in thrall, mutually enthralled. “Enthrallment” also captures Heidegger’s insistence that individuals do not construct their own worlds of meaning, but are taken up and thrown into pre-existing worlds of meaning by greater historical forces: languages, cultures, traditions. Meaning comes in worlds, and worlds are collective, not individual. And collective meanings seize and hold sway over individuals. In Being and Time, Heidegger began his account of meaning and its relationship to man using the subject-centered phenomenological method adopted from his teacher Edmund Husserl. But the collective nature of meaning, and the fact that the individual has collective meanings imposed upon him, chafed against the phenomenological method, in which the philosopher reflects upon how the world is given to him/us. Because Heidegger realized that the human subject itself is structured by inherited meanings (language, culture, tradition), he needed to move outside the subject-centered phenomenological perspective and explore the relationship of man and meaning from the side of meaning rather then the side of man. Being and Time remained unfinished because, at the time, Heidegger was unable to articulate this shift in perspective. Heidegger characterized his later philosophy not as transcendental phenomenology but as “seinsgeschichtliches Denken,” which is literally and misleadingly translated as “being-historical thinking.” Heidegger, however, is not thinking of mere history, but of what lies above and behind history, the intellectual conditions that make it possible. For Heidegger, history is not just a record of rulers, battles, and inventions, but of the underlying assumptions about reality that shape politics, warfare, and technology. Heidegger divides European history into a succession of different epochs or dispensations of meaning: the pre-Socratic and Socratic periods of classical thought, the Christian world, early modernity, and the completion of modernity in modern nihilism, i.e., man-centered technological materialism. For Heidegger, the history of Western philosophy, from Plato to Nietzsche, is a trajectory of decline. The objective reality of beings is forgotten, as Being is defined in terms of knowability in thought and manipulability in action. The intimate connection of man and world is forgotten, replaced with the dualism of mind and matter. The dependence of the individual on received systems of collective meaning is forgotten, replaced with arrant individualism and the idea that human history and human nature can be mastered and reconstructed according to conscious plans. Finally, we have forgotten the fact that none of this was inevitable, that another dispensation — the new beginning of Dugin’s title — is possible. In his memoir Philosophical Apprenticeships  , Hans-Georg Gadamer, one of Heidegger’s most eminent students, recounted a meeting after the First World War in which different radical ideas for the salvation of Germany were proposed. One voice declared that phenomenology was the only possible solution. Heidegger himself certainly linked phenomenology to the crisis of his time, thus his philosophical writings have an intensely rhetorical dimension that is by turns moral, political, religious, poetic, prophetic, eschatological, and often strongly nationalistic. Heidegger hoped that National Socialism would provide a fundamental alternative to modern man-centered materialism, but when National Socialism itself turned out to be another form of materialist modernity, Heidegger criticized it from the Right and never gave up the hope that a real Right-wing alternative would emerge. Creating that alternative is the aim of New Right today. After the Second World War, Heidegger gave up on politics proper. If the problem with the modern world is the idea that we can understand and control everything, including history and society, then working out and implementing an anti-modernist political program is not a solution, but just another version of the problem. The only way to overturn the idea that everything can be understood and controlled is to find things that are mysterious and uncontrollable. For Heidegger, the source of the idea that everything can be understood and controlled can itself be neither understood nor controlled. When one looks into a light, the light itself obscures its source. The same is true of meaning. The modern dispensation of meaning, like all dispensations of meaning, arises from sources that are obscure. This is why Heidegger speaks of each dispensation as an Ereignis, an event, meaning an inscrutable contingency. For Heidegger, meaning is finite: if the intelligibility and manipulability of beings is highlighted by the modern dispensation, that simply means that other dimensions are being obscured. And the source of that dispensation is itself obscure. But if the modern dispensation is finite, it can never be final. A new dispensation can dawn. What is hidden can come to light, and what is illuminated can become obscure. We do not know how or why. But we do know that man and meaning belong together. That means that the present dispensation cannot exist without us. Even though it holds us in thrall, it somehow depends upon us as well. We sustain it whenever we act under the assumption that everything can be transparent and available. Whenever we want things to be faster or cheaper or more convenient, we are sustaining the modern dispensation. But what if we attune ourselves to the mysterious and uncontrollable? What if we cultivate a taste for the poetic and the mystical? What if we reject utilitarian values for the beautiful, the useless, or the heroic? What if we prize uniqueness over uniformity, the earthy over the plastic, slow food over fast food, the limits of nature over the power of the technologically weaponized will? What if we opt out of mainstream culture and create a counter-culture that cultivates a different worldview and way of life? Then we are no longer sustaining the present dispensation. And if enough of us opt out, surely a new dispensation must dawn. We know not how or why. But we do know that historical change is possible. Indeed, we know that it is already happening. Heidegger did not believe that philosophers or poets are the hidden legislators of mankind, excogitating theories that give rise to new historical dispensations. This is pure anthropocentrism, the idea that man makes history rather than history makes man. Instead, Heidegger believed that philosophers and poets receive their ideas from the hidden currents of the Zeitgeist. They look like they create ideas because they merely receive them first. Thus Heidegger’s own thought, and the thought of others like him, is not to be dismissed as merely subjective and ineffectual ideas hatched by alienated dreamers. For Heidegger sees the very existence of such ideas as the stirring of the most sensitive souls, the earliest risers, to the dawn of a new dispensation. By hearkening to Heidegger and the other critics of modernity, one is hearkening to a new dispensation. One is becoming the change that one desires. One is living under the next dispensation today. Thus perhaps one can excuse Heidegger for obscurity, for the medium is clearly part of the message. But if communicating this message was as important to Heidegger as it seems, you would think he would have striven for utmost clarity — that he would have tried to imitate Schopenhauer rather than to outdo Kant, Fichte, Hegel, and Schelling for Teutonic turbidness. He can’t plead lack of talent, since his lecture courses are famously clear. He had to work hard to write texts as pretentious and maddeningly obscure as Contributions to Philosophy. But there is nothing contradictory or self-defeating about a clear exposition of the nature and role of obscurity and hiddenness. Shadows, gaps, and abysses can have cleanly delineated edges. If Heidegger is right, then it really is of epochal importance that he find an able popularizer, his own Alan Watts. Heidegger’s fundamental ontology is not, however, about the “primordial source” of beings. Again, it is about what makes it possible for beings to have meaning, to be taken up into worlds of intelligibility. This is characteristic of Dugin’s exposition of Heidegger: it isn’t any more readable than Heidegger, and half the time it isn’t even Heidegger. It is easy to get this sort of impression from Heidegger’s posthumously publishing writings from the 1930s, such as Contributions to Philosophy. But one should take the accounts of Ereignis that Heidegger published during his lifetime, particularly in his 1962 lecture “Time and Being,” as his most considered view. And there Heidegger describes Ereignis as the generic structure of all dispensations of meaning: all ages of history emerge and take hold of us as inscrutable contingencies. Worlds of meaning happen like the rain: when we say, “It’s raining,” there is no “it” that is actually raining, just as there is no “it” that is sending a new dispensation. It just happens. This, by the way, is the only passage in this admirable translation that one might be tempted to read in a Russian accent. As a material object, this book is most impressive. The cover may look at bit like an English prog rock cover from the 1970s, but I like that sort of thing. The design and typesetting are quite elegant and readable, setting a new standard for Anglophone New Right publishing. I appreciate the use of footnotes rather than endnotes, and I particularly admire the care lavished on the extensive index. Radix has spared no labor or expense to bring out this volume. This is definitely a prestige project: Heidegger is a prestigious thinker. A translation into English increases Dugin’s prestige. Heidegger and Dugin bring prestige to Radix. Lest the Radix crew be suspected of anti-Semitism, Paul Gottfried helps out with a Preface and even says some good things about the book in the process. But, in the end, my reservations about Dugin remain unchanged: he is opposed to a racial criterion of European identity; he is opposed to European ethnonationalism; he is an apologist for Russian multiculturalism and imperialism. I do not see how any of his works contribute to staving off the biological extinction of the white race. Heidegger can contribute to the metapolitical foundations for white salvation. But Dugin’s Heidegger is not Heidegger, and Dugin himself is just a distraction.